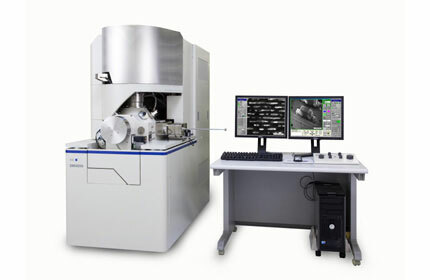 (Nanowerk News) Analysis instruments manufacture SII NanoTechnology Inc. (SIINT) a 100% subsidiary of Seiko Instruments Inc. (SII), releases the SMI4050 Focused Ion Beam system on August 30 which is improved Processing Speed, Processing Accuracy and Image Resolution for Processing. Focused Ion Beam system (FIB) is the system which enables (1) etching, (2) deposition, and (3) observation in a single system using the nanometer order diameter ion beam. Combining these functions, the FIB has contributed to the development and the improvement of electric components, advanced functional materials, and many others including semiconductors by performing the circuits modification of semiconductor devices, the defect characterization, the cross sectioning and observation, the TEM sample preparation, metal grain observation, and others. SIINT has developed the technologies for higher performance such as the improvement of secondary electron image resolution and accuracy of computer aided automatic processing. Recently along with the increasing need for higher throughput, better image resolution and the precision stage have been required. At the same time, higher milling speed has been strongly required. Equipped with the new ion beam optics which increased probe current, the SMI4050 delivers the wide area processing and the high resolution imaging in a single system. SMI4050 contributes to meet the variety of need of R&D. Long processing time has been required for several hundreds micron width cross-sectioning. Equipped with the new ion optical system, the SMI4050 reduced the processing time substantially. TEM sample preparation requires the final polishing processing by a low acceleration voltage ion beam. Also, the SMI4050 offers accurate and precise processing by the improved secondary electron image resolution at ultra low acceleration voltage. SMI4050 delivers the clear images even at 0.5kV (optional) enough to decide the position for final milling. High precision 5-axis motorized mechanical eucentric stage enables to specify the coordinates more accurately for more fine alignment for imaging and continuous processing TEM sample preparation. Excellent user friendliness gives SMI4050 to achieve the automated such as an accurate and automated TEM sample preparation which does not require the high skills.